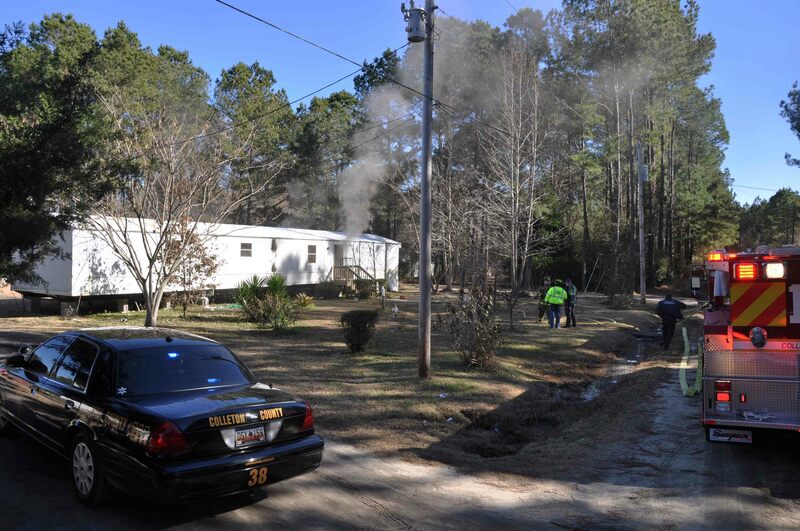 An early morning house fire has left a Walterboro family displaced. 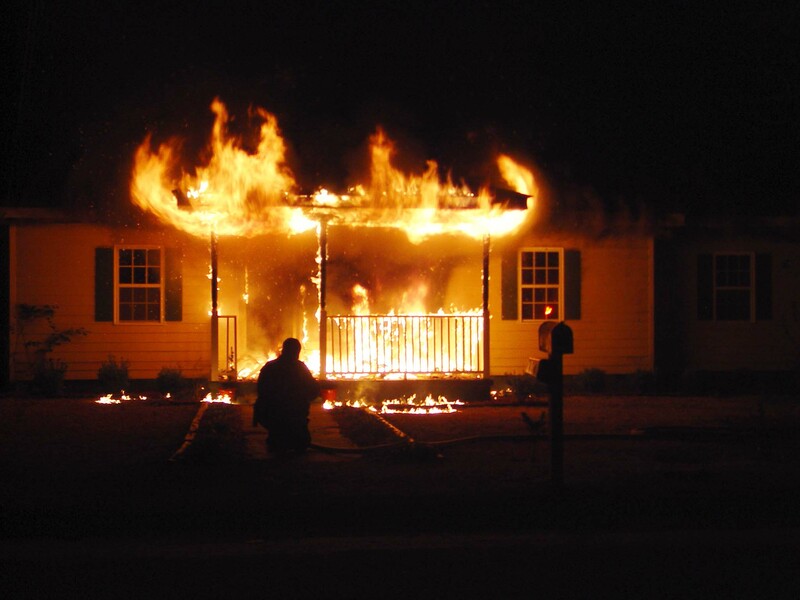 The fire was reported at 03:53 at 101 Edgewood Street east of Walterboro. Engine 19 arrived to find the singlewide mobile home 75% involved. Three people inside the home narrowly escaped. There were no working smoke alarms in the building. A 14 year old girl was awaked by intense heat to discover her bedroom was on fire. Click here for additional information. 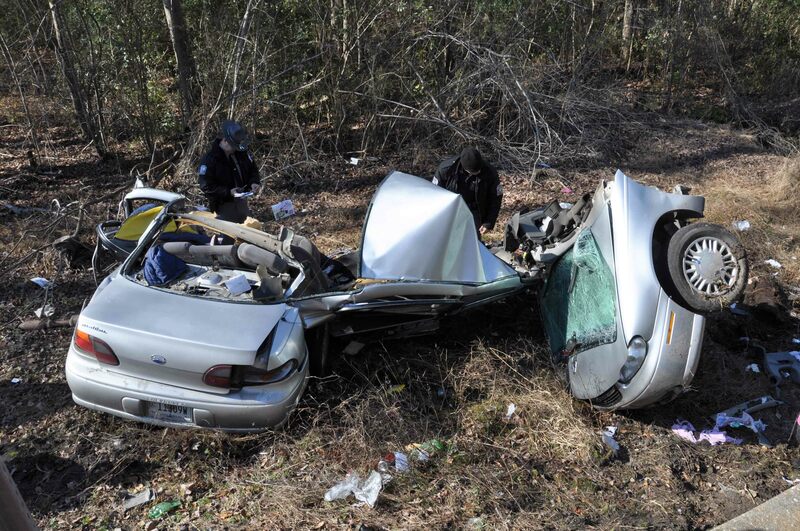 A single car high speed MVC has left a Walterboro man in critical condition. Fire units were dispatched to Charleston Highway just west of Jacksonboro Road when an eastbound Range Rover traveling nearly 100 mph failed to negotiate a curve. The vehicle had just passed a Sheriff’s Deputy on a long straight portion of the highway. Click here for additional information. A 14 year old girl was injured when a small utility vehicle in which she was riding overturned on Jonathan Lane Sunday afternoon 30-Jan at 13:44. 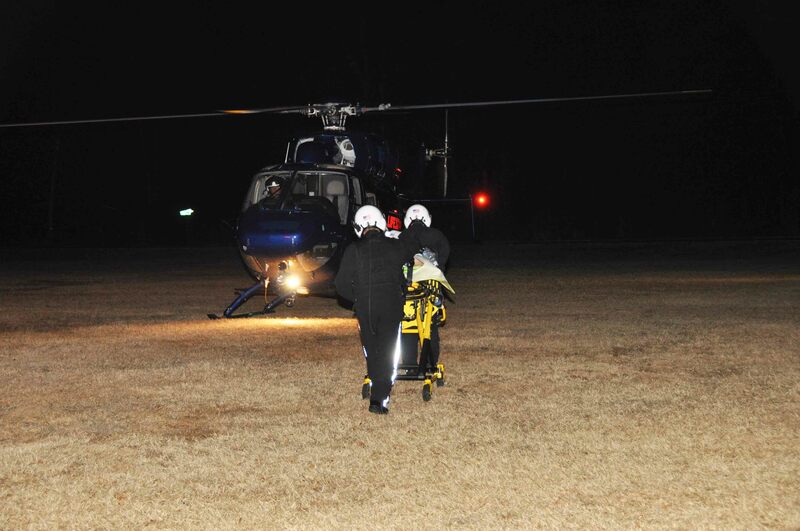 The girl received multiple traumatic injuries when she was thrown from the vehicle. 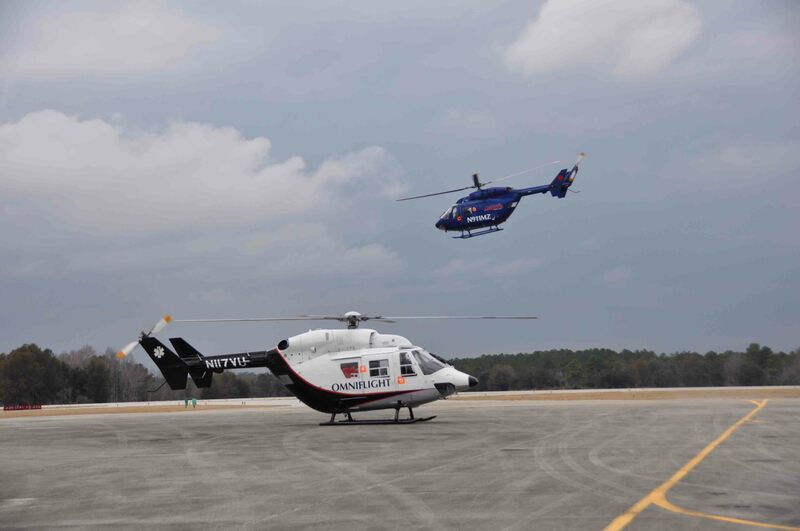 She was treated at the scene by Firefighter-Paramedics and transported to the Lowcountry Regional Airport to meet with an Omniflight helicopter. Click here for additional information. The weekend woods fires continued on Sunday, 30-January. As dry conditions and winds spread the fires in several areas of the county. Eight separate woods fires occurred in addition to other responses between the hours of 13:06 and 18:33. Click here for additional information. Battalion 1 spotted a column of thick black smoke off of Green Pond Highway Saturday afternoon, 29-January. He had just cleared up from the 100 acre woods fire in the Catholic Hill Community when he noticed the smoke. 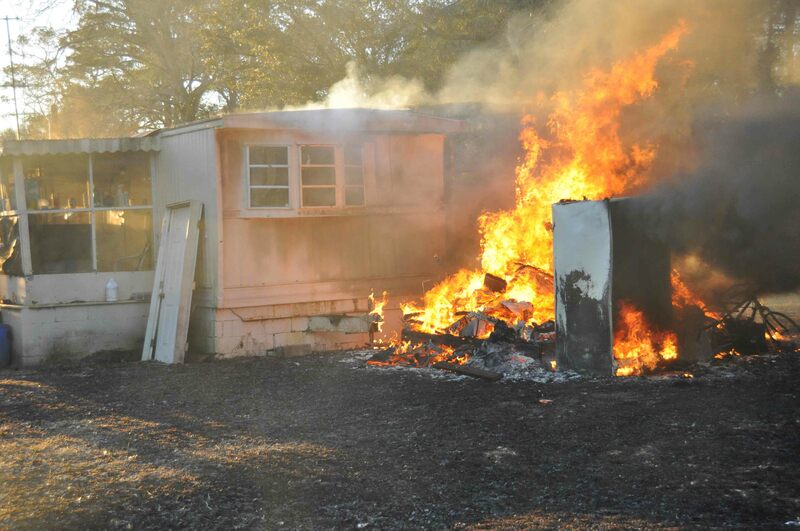 Upon investigation, he discovered a yard on fire in the 100 block of Windy Hill Lane, which had spread to a 10x10 storage building and a singlewide mobile home. Click here for additional information. Two men were injured in a two vehicle collision on McLeod Road at the intersection of Pleasant Grove Road, Saturday 29-January at 10:54. A northbound Ford pick-up truck pulled into the path of a eastbound Jeep. The force of the collision caused the pick-up truck to over-turn. Both vehicles received heavy damage. The driver’s of both vehicles were able to self extricate. Firefighter-Paramedics treated both individuals at the scene. Click here for more info. 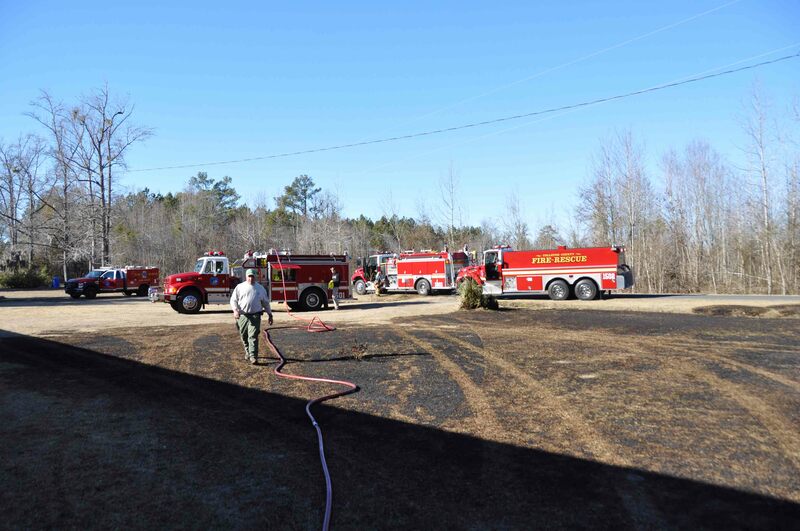 County and State Forestry Firefighters had a busy weekend with dry conditions and moderate winds fueling multiple woods fires throughout the county. 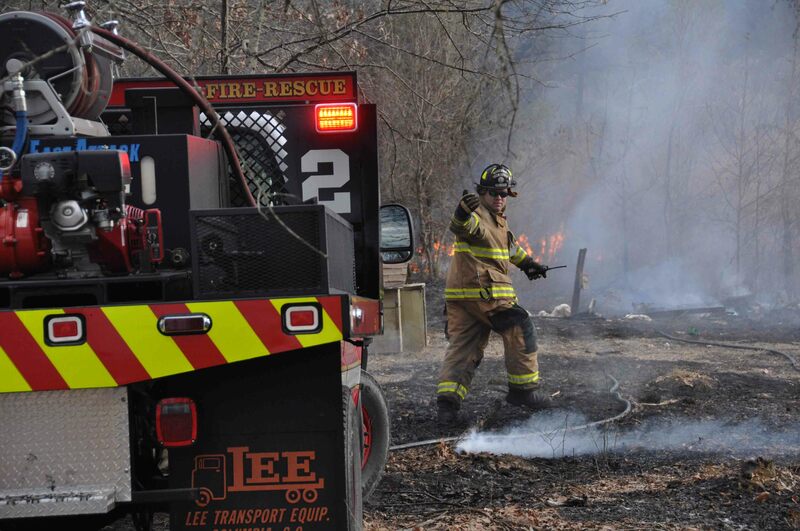 In addition to other responses, units responded to eleven woods fires between 12:19 and 18:54. Click here for additional information. Our condolences go out to the family of Station 23 Firefighter Lawrence Dowler who entered into his eternal rest Friday morning, January 28, 2011. Click here for information on funeral arrangements. Congratulations to Firefighter/Paramedic Roger Johnston on successfully obtaining his Paramedic Certification. We wish to extend congratulations to Firefighter-Paramedics Matt Parler, Justin Warko and Bryon Eadon for successfully obtaining Paramedic Certification. The Town of Edisto Beach Fire Department is sponsoring an extrication training opportunity on the beach this Saturday 29-January. The session will begin at 08:45. Several cars will be available for practice and a representative from Rescue Tech will be on hand to demonstrate his product. If you are looking for an excuse to go to the beach, come and see what the rescue tech tool will do. Contact Chief Waddle at 843-869-2506 if you have any questions. Please confirm your attendance, if you are planning to attend. This will enable them to facilitate the event. Firefighters responded to a rapid moving grass/woods fire that damaged several buildings Monday afternoon 24-January at 15:32. Callers to 9-1-1 reported a large woods/grass fire near the end of Durango Lane north of Cottageville. Engine 9 and Medic 9 arrived to find a fast moving, approximately four acre woods and grass fire that was being driven by moderate winds. Click here for additional information. An unattended trash fire has left a Sniders family displaced. 9-1-1 Operators received the report of a structure fire at 883 Scuffletown Road Sunday afternoon, 23-January at 13:15. 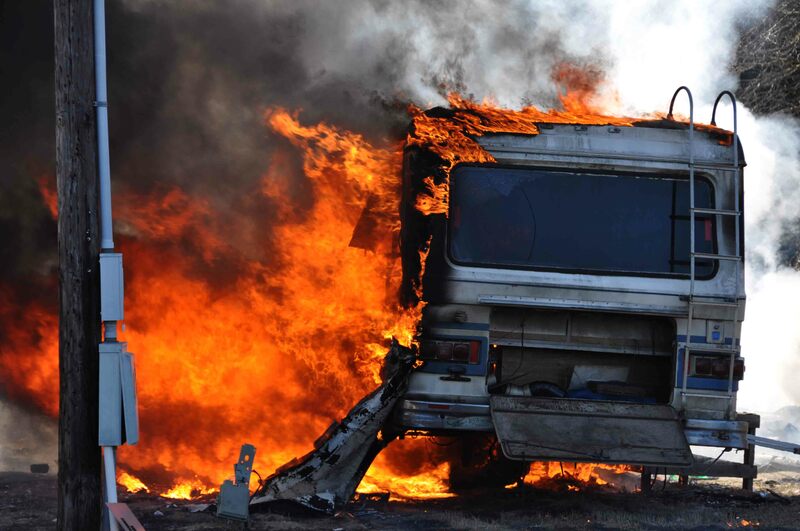 First arriving units found a fully involved 30 foot motor-home that was set up as a fixed residence. A heavy column of black smoke could be seen 8 miles from the scene. Click here for additional information. Tactical Response Team members trained on hazardous materials mitigation on Saturday morning, January 22, 2011. The drill commenced at 08:30 and involved a tractor trailer transporting Ethylene Oxide which was leaking. As part of the drill, two firefighters became incapacitated and had to be rescued by Hazardous Materials Technicians wearing Level A chemical protective suits. Click here for additional information. A grass fire spread through a yard causing heavy damage to a storage building and damaging a mobile home. 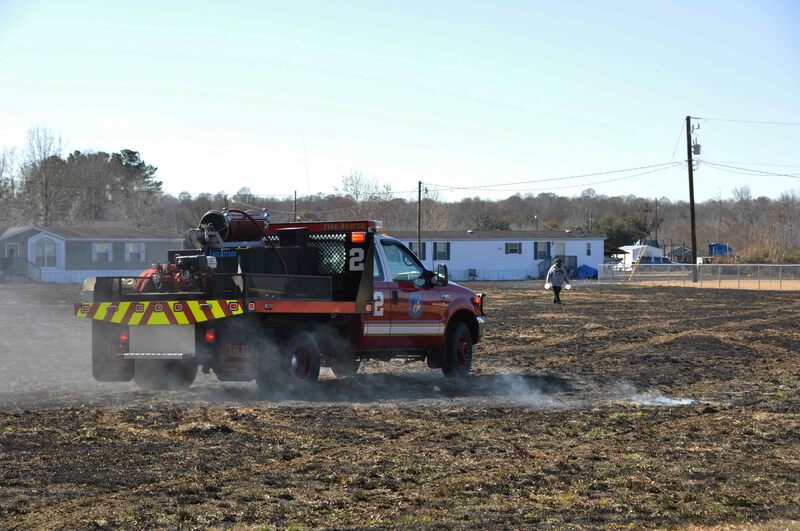 Firefighters were called to 5169 Cross Swamp Road at 14:17 Friday afternoon 21-January, for a fast moving grass fire. 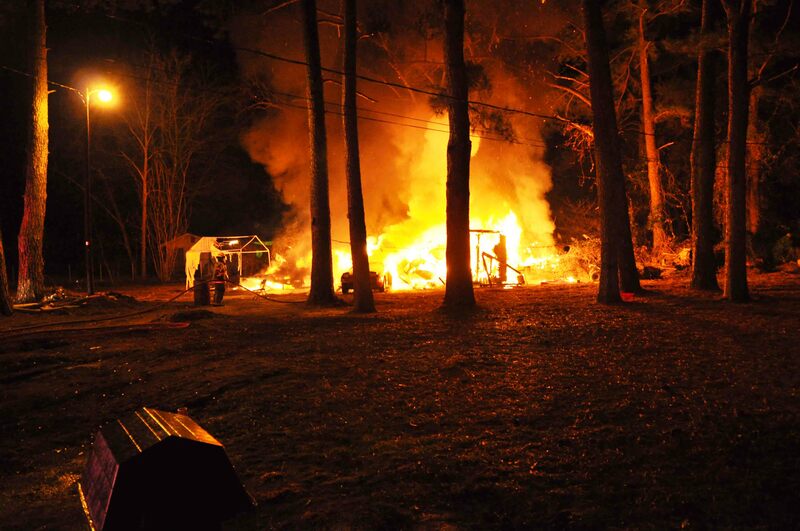 While enroute, Engine 15 was advised a structure was involved. Engine 15 arrived to find a rapid moving grass fire and a well involved 10x10 storage building. Click here for additional information. SLED is assisting in the investigation of a structure fire in the Town of Smoaks. Colleton Firefighters were alerted to smoke coming from a residence at 10 New Street Saturday evening 15-January at 2315. Firefighters arrived four minutes later to find light smoke coming from the eaves of the wood frame single family dwelling. Engine 7 deployed one 1-3/4 handline. Click here for additional information. 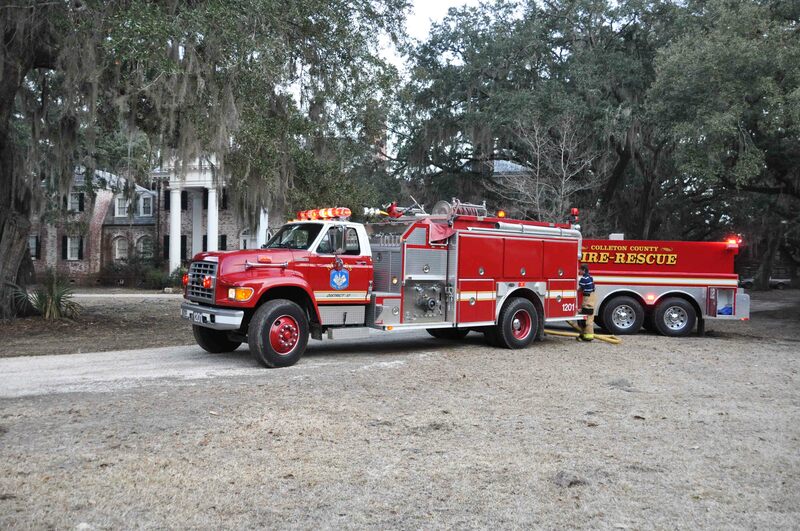 Medic 18 responded to a residence in the 19000 block of Lowcountry Highway Saturday afternoon 15-January at 1458. 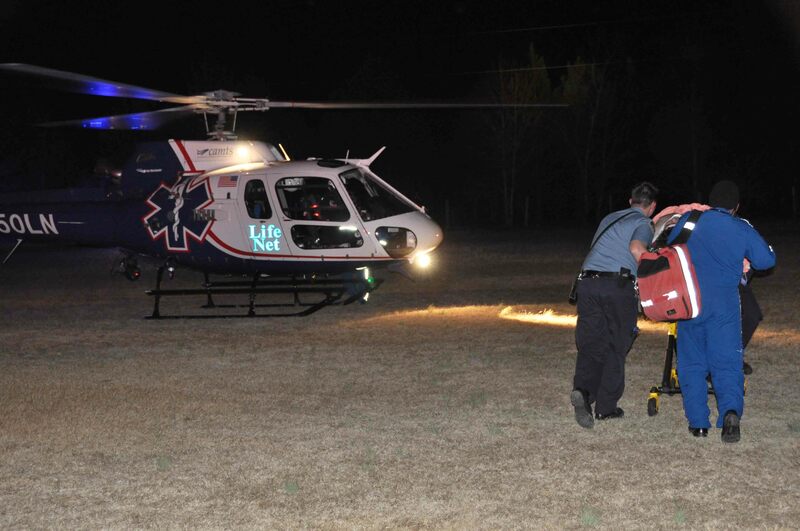 A woman received traumatic injuries in her yard after she was accidently backed over by a utility trailer. 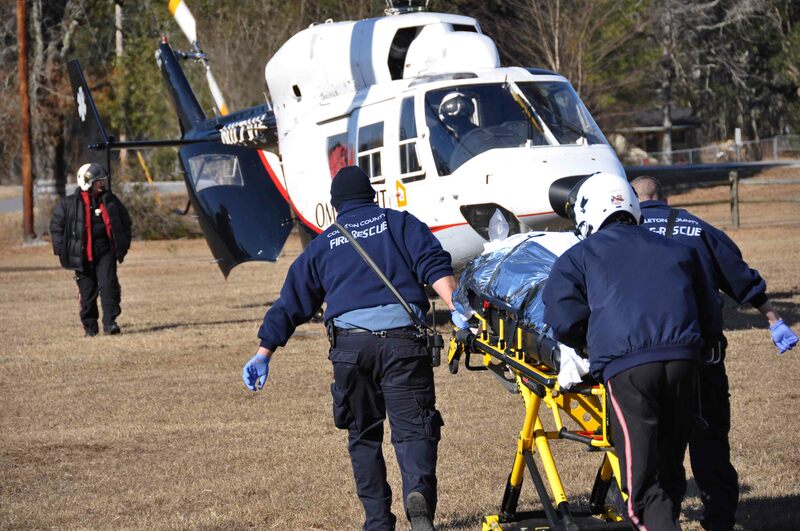 Firefighter-Paramedics treated her at the scene and called for a medical helicopter to transport her to a trauma center. Click here for additional information. At 06:59, Stations 1 and 26 responded to a high speed MVC involving a Honda Element which struck the side of an empty log truck. The car cleared a curve on the dark rural road and the log truck was across the roadway. The vehicle struck the trailer behind the cab. Engine 26 and Medic 26 arrived to find the small vehicle with heavy front end damage and the female driver entrapped in the wreckage. Click here for additional information. 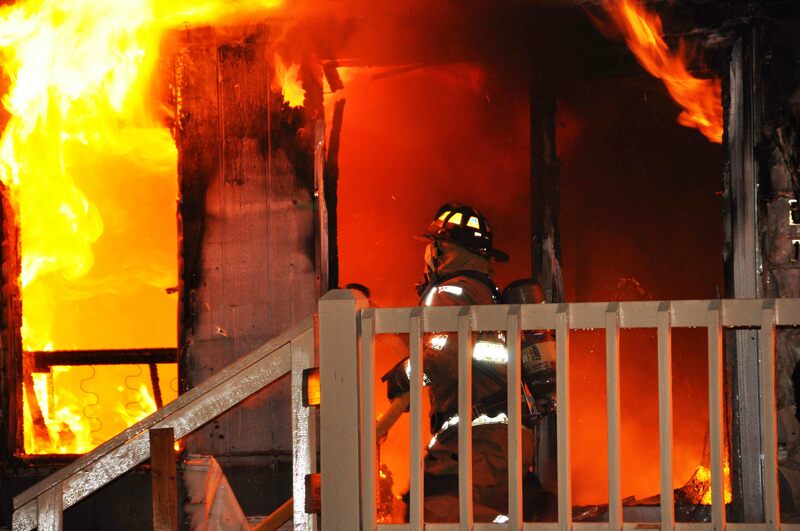 A 70 year old Cottageville man dove from a window to escape his burning structure Thursday evening 13-January. At 23:24 9-1-1 Operators received several reports of a singlewide mobile home with flames coming from the structure at 275 Brocktown Road. 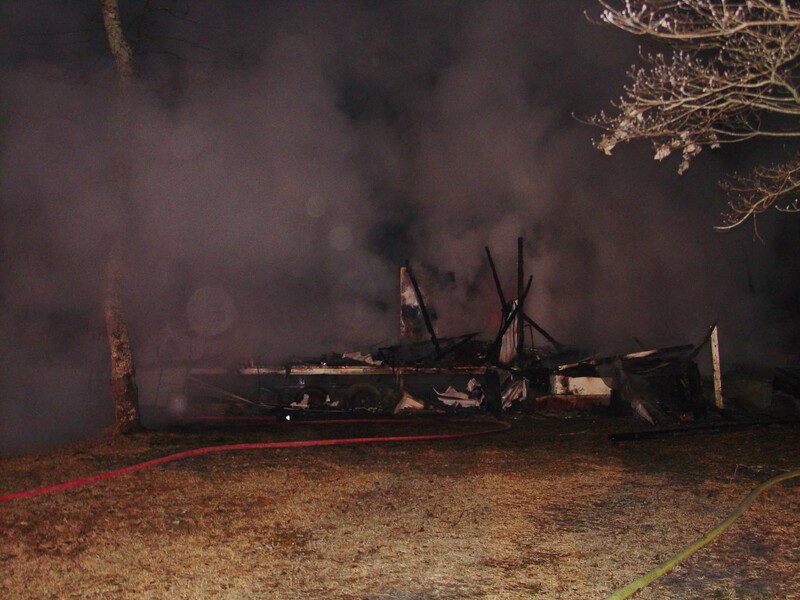 Engine 9 and Medic 9 arrived minutes later to find the dwelling fully involved. Firefighters deployed two 1-3/4 handlines knocking the flames down in about 15 minutes. Click here for additional information. Medic 1, Battalion 1 and Car 12 responded as mutual aid to the City of Walterboro Public Safety at a structure fire located at 111 Blanchard Street Wednesday, 12-January at 18:07. Battalion 1 arrived to find heavy fire showing from the front of the single family dwelling. 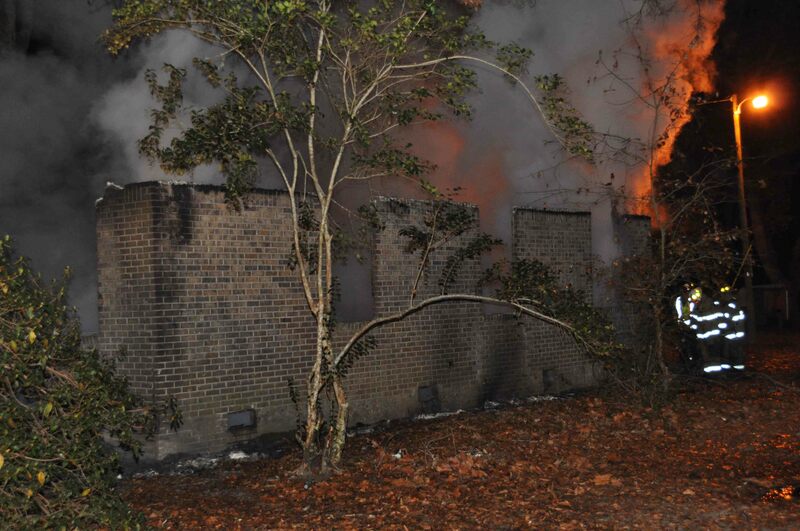 Walterboro Engine 2 deployed one 1-3/4 handline, quickly bringing the fire under control within minutes. Click here for additional information. A 22 year old Ruffin woman has succumbed to her injuries following a high speed single car MVC on Cypress Pond Road near Ulmer Lake Road, Wednesday morning 12-January at 11:20. The southbound Chevrolet Malibu left the roadway after exiting a curve and apparently over-corrected while coming back on the road, causing the vehicle to slide sideways. Click here for additional information. 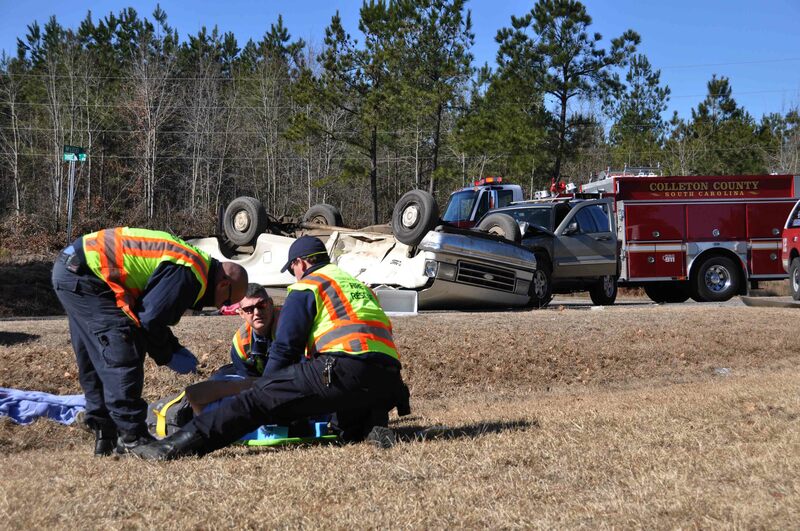 Bystanders pulled a 77 year old truck driver to safety following a single vehicle MVC in the 24500 block of Augusta Highway (SC Hwy 61) Wednesday morning 12-January at 10:02. The loaded log truck was traveling eastbound when it left the roadway, struck two separate driveway culverts before overturning and catching fire. The load of logs were propelled forward.....click here for additional information. 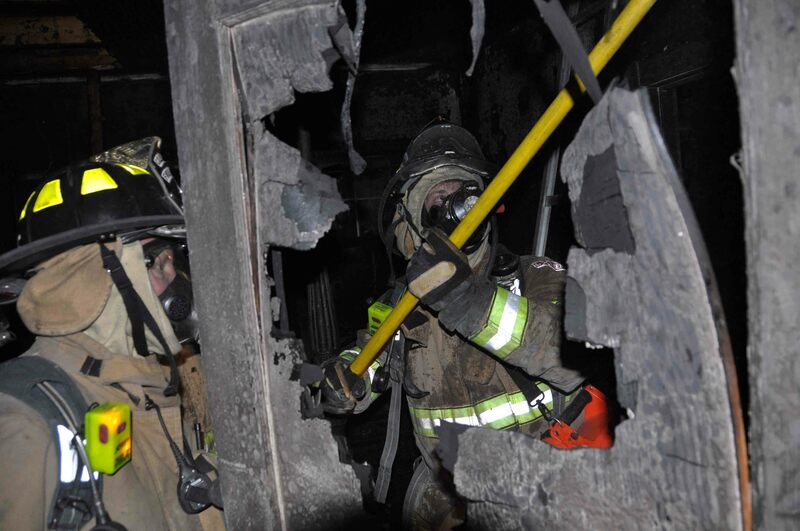 A Tactical Response Team Training Session is scheduled for Saturday, January 22, 2011 at 0830 at Station 19. The training will include a practical Hazardous Materials Incident evolution and should conclude by lunch. All interested personnel are welcome to attend. Multiple woods fires kept firefighters busy for the second weekend in a row, fueled by dry conditions and high winds. Despite two days of rain last week, dry conditions persist. 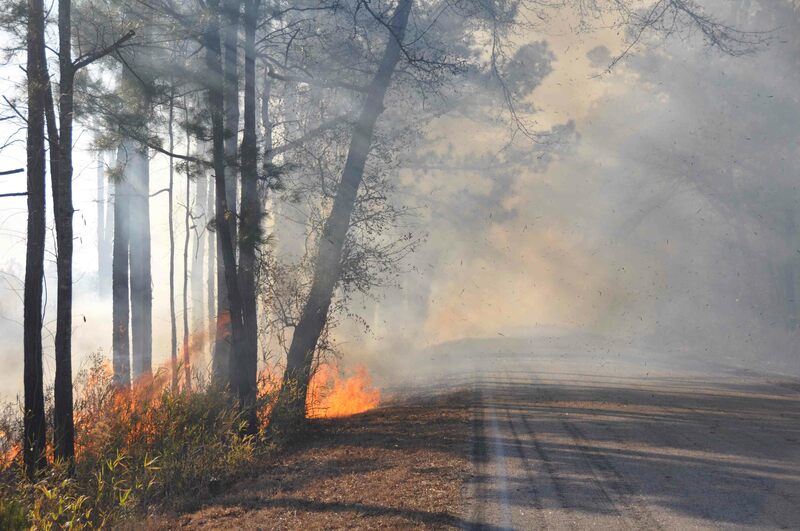 20 to 30 mph winds quickly spread flames through the dry grass and woods. The largest fires occurred Saturday in the Ritter Community and Sunday on Keegan Road. Click here for additional information. 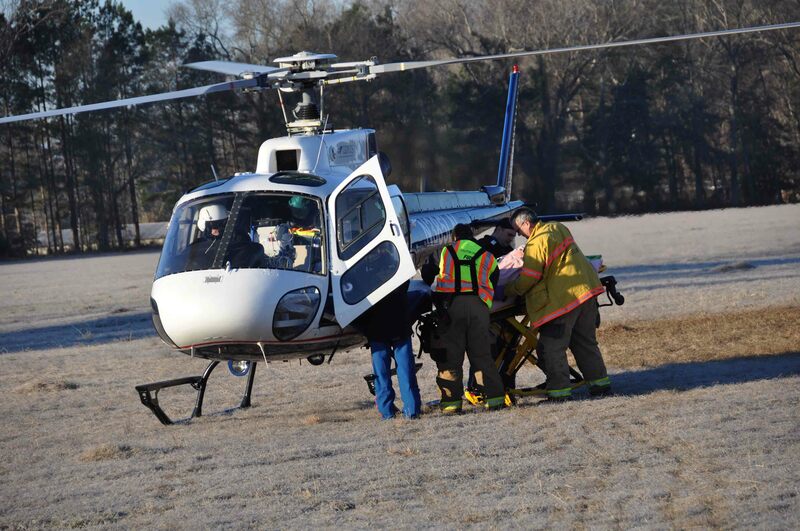 A high speed MVC has sent a 16 year old male to a Charleston Trauma Center. At 19:37, a Chevrolet Tahoe lost control in a curve on Folks Road near Stratford Lane near Islandton. The SUV entered the ditch, then struck a large pine tree before re-entering the roadway and striking a pickup truck. The impact removed the front of the vehicle at the fire wall, tossing the engine and transmission... click here for additional information. Stations 1, 2 and 6 responded to a structure fire at 233 Ivenia Brown Road south of the Green Pond Community at 0400, Friday morning 7-January. Engine 6 and Medic 6 arrived to find the smoldering remains of a single story brick veneer structure. All that remained was the brick veneer and concrete front porch. The entire interior and floor of the building had already burned away. Click here for additional information. 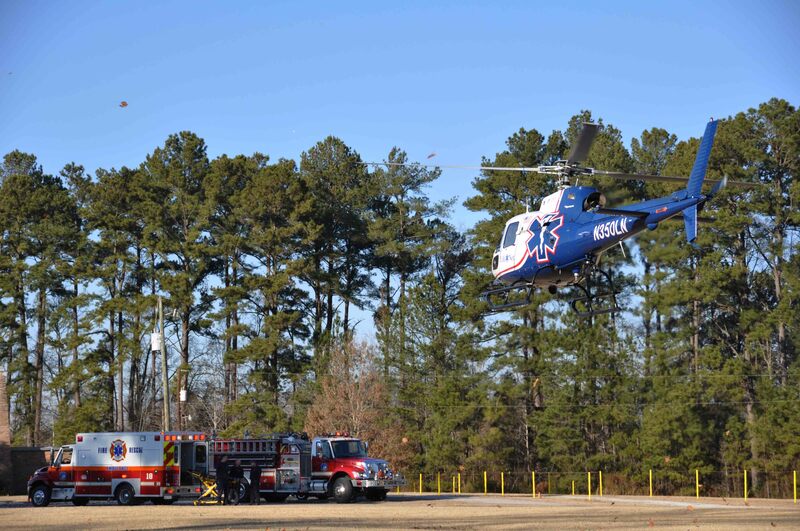 A mother and small child were flown to a Trauma Center following an accident on Confederate Highway Thursday 6-January. Engine 3 arrived at a single car MVC in the 6500 block of Confederate Highway (SC Hwy. 641) near the Colleton/Allendale County Line at 1316. The west bound 1990 Pontiac Grand Am left the roadway on the east bound side of the highway... click here for additional information. Stations 1, 12, 19 and 27 responded to a structure fire at 1310 McMillan Street Monday 3-January at 11:09. A neighbor reported seeing smoke coming from the residence. Engine 19 and Medic 19 arrived to find light smoke coming from a kitchen vent on the front of the residence with smoke visible around the roof seams on the singlewide mobile home. Click here for additional information. 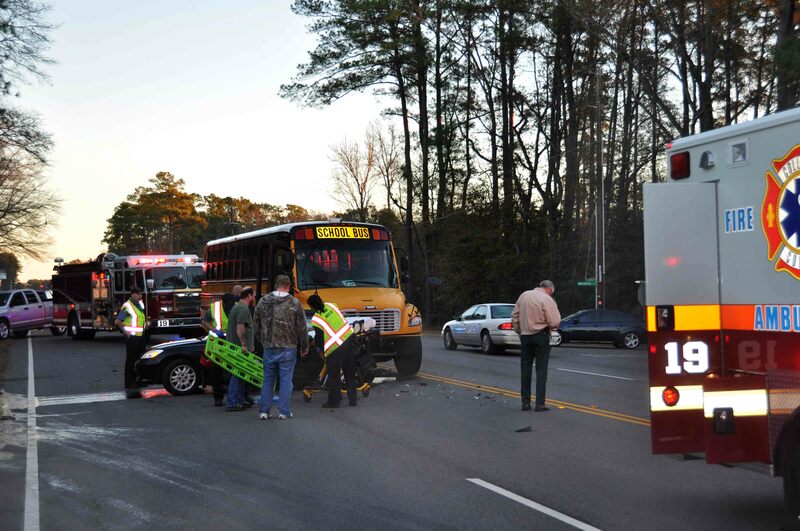 A collision between a School Bus and a passenger car has sent one woman to the hospital. The accident occurred on Jefferies Highway at the intersection of Wintergreen Road Monday morning 3-Janaury at 07:23. The southbound bus, carrying four children struck a southbound car in the rear. The car received heavy damage resulting in the female driver receiving multiple non-life threatening injuries. Click here for additional information. 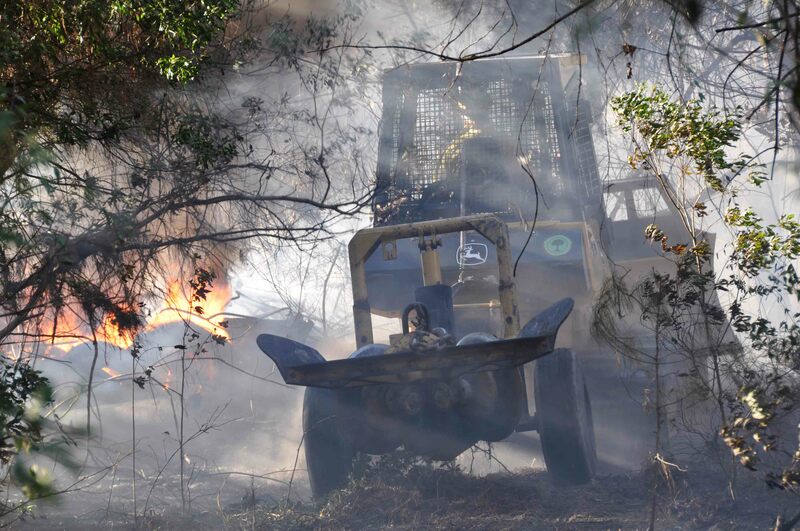 Saturday night’s rain was a welcome sight, after multiple woods, grass and debris fires kept county fire forces busy Friday and Saturday during the holiday weekend. Dry windy conditions made the environment right for woods fires. Combined with people enjoying a long weekend cleaning yards and burning debris lead for rapid spread of many yard debris pile fires... click here for additional information. 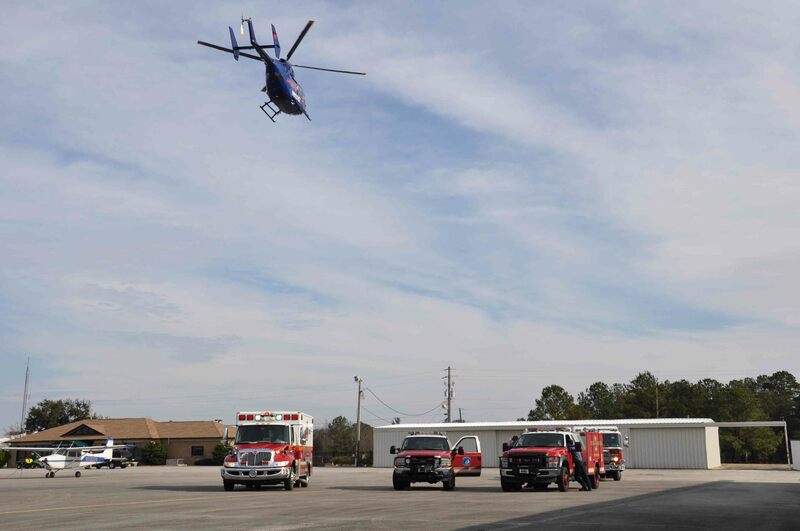 An explosion in a work shop has resulted in a Walterboro man being sent to the Augusta Burn Center. At 2049 Saturday 01-January, 9-1-1 operators received several reports of an explosion in the 200 block of Enterprise Street. Additional reports indicated a large fire with a man being burned. Engine 19 and Medic 19 arrived 6 minutes later to find a fully involved work shop... click here for additional information. We extend our deepest sympathy to Firefighter-EMT-I Roger Johnston, his wife Karen and their family on the loss of Karen’s grandmother. Ms. Beverly Bouchepte passed away at home Saturday following a short illness. Visitation will be held Sunday 2-Janaury from 6-8 PM at Orangeburg Memorial Church of the Nazarene, located at 569 Berry Street in Orangeburg. The funeral service will be held Monday at 3 PM at the same location. Please remember them in your prayers. We wish to congratulate Firefighter Brian Bishop on successfully obtaining EMT certification.